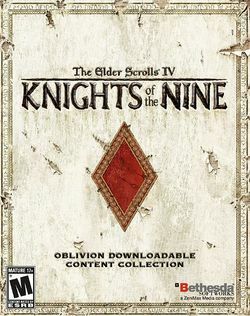 The Elder Scrolls IV: Knights of the Nine is an expansion for The Elder Scrolls IV: Oblivion. It features an all-new faction and quests for noble characters and answers many of the questions surrounding the Ayleid ruins found throughout Oblivion. Players can join a new faction and found their own order of holy knights, leading them into battle against a sorcerer-king and his demonic minions while exploring massive dungeons and searching for legendary relics — the holy armor and weapons of the Divine Crusader. This page was last edited on 16 August 2016, at 15:21. This page has been accessed 15,499 times.